Not a fan of beigh on beigh;but I do love the coat. 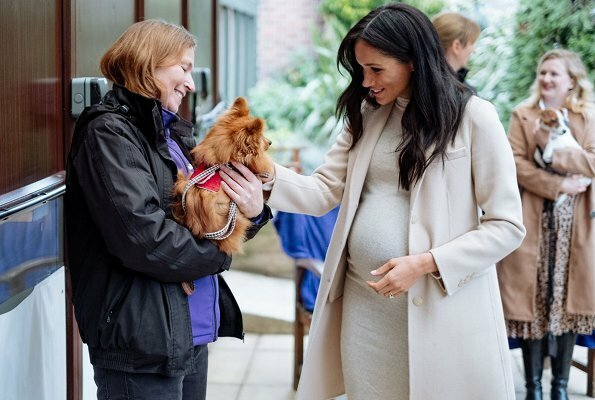 The duchess is clearly a dog lover and in her element.. I agree with you about the coat, it really looks good. I don't like the dress much, I like the colour, I'm okay with the length but that neckline doesn't look nice in my eyes. I'm also not a big fan of the shoes. Those shoes are not for january, at least not in Europe. Completely agree. It's rudiculous as the Duchess looks "out of place and time". Meghan might find the weather mild, she lived in Canada. Very nice - good combination of high/low cost items. She looks well. It was a chilly day today in London so don't know how she managed without tights - maybe she's one of those lucky people who doesn't feel the cold. Anyway, I think she looks great. 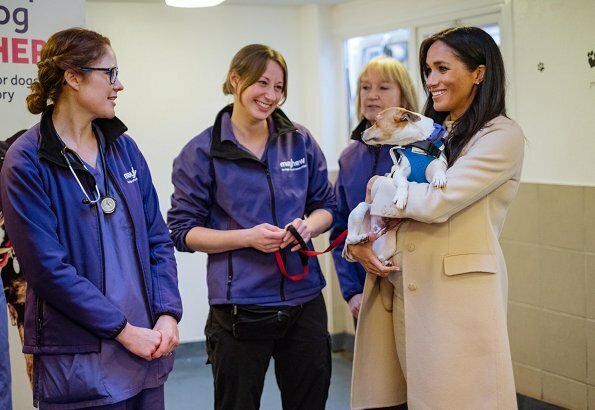 I'm surprised she would wear very high, beige suede heels and a very expensive beige coat to visit an animal shelter. Also, the tight, knit dress seems a bit, um, er, 'tarty' for a duchess on an official visit (just my opinion). She is supposed to be 'on duty' for the Queen and BRF - so I guess they're ok with this - which means she really is a game changer. I liked the whole outfit but maybe more for springtime than January. Meghan really does have that pregnant glow, she looks gorgeous! Noen Snow: A close friend of mine, very attractive woman, had men come up and overtly flirt with her when she was pregnant. Pregnant women are often attractive to men. Tarty is a perfect description of the dress (NOT the person!). I did look back at D of C, the Swedish & Danish royals etc and there are some tight dresses but nothing as revealing as this. I'm in a quandary now. I'd much rather she wore light colours like this rather than the never ending black and navy BUT this dress would show the bump far less if it was dark!! She Is certainly looking good but massive for a first baby if she is really only 6 months. The shoes are no good. But I like the resto of the outfit. She shines out in these light beige essemble. Beautiful choice. And in my opinion she knows best whether she will be freezing or not in her outfit. I like this elegant color for Meghan, as a matter of fact every woman looks well in that color. If the dress was a bit bigger she would have look great. If a dress was little bit bigger and coat a little bit longer she would look perfect. 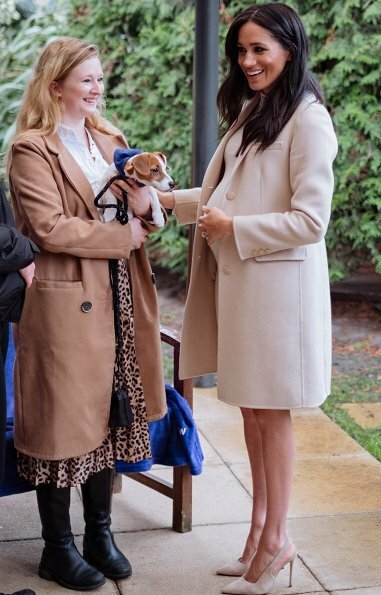 Beige is one of the best colors for Meghan . A simple monochromatic look. Pregnancy fashion has evolved from the shapeless tents of a bygone era as we can see on the model. This does not prevent some from clutching their pearls and reaching for the fainting couch. There is a lot of ground between wearing a 'tent' and wearing skin-tight clothes. Seraphine makes beautiful maternity wear - Princess Victoria of Sweden was a great role model for this. We are not in the 50s anymore, a time when women did not even use the word "pregnant", much less show the shape of their body. Pregnancy fashion has most definitely evolved, thank goodness! This outfit looks wonderful. The beige is very flattering. It is also the perfect color to wear when visiting animals so the hair won't show on her clothes. LilyBart at 8:46 AM, well said! I appreciate your sensible and accurate comment! I don't know if there is a protocol about wearing tights or not. Fact: during this very hot summer here in Europe there was a discussion wether female clerks in a bank or insurance company should be "allowed" to appear at their workplace without tights or not, and the answer was that many of these clerks themselves said that it is kind of dubios NOT to wear tights at work and therefore wore them deliberately. I agree to that. Meghan should wear tights, especially with such a short dress. She does not look good, does not look reputable without tights. I agree with you, Coralie. Fwiw, I've found that the subject of whether women should wear tights (pantyhose here in the States) has now become an emotional flashpoint, similarly to the subjects of whether skintight pants or formitting maternity looks are appropriate. Expressing the opinion that (other than at the beach) a woman's legs generally look more attractive with the very sheer covering provided by pantyhose can elicit pretty shrill condemnation implying that only someone who is at least a grandmother (or possibly a great-grandmother) could possibly hold such a view :-D. I think we're all learning that fashion blogs can very easily become combat zones. "Fashion blogs can become combat zones" - that is true, Jane Chantal! Jane Chantal, as a long time supporter of pantyhose and tights, I’ve been surprised to receive the reaction you mentioned. Some people stateside seem horrified by pantyhose and yet only 20 years ago they were not only expected but popular. Thigh-highs and other pretty, feminine hosiery could be found in every Victoria’s Secret store around the country. Now we are criticized for mentioning it. The fact is, for those of us with less than perfect skin, hosiery is a way to feel confident about ourselves. Even the sheerest hose provide some warmth and for some of us support hose help preserve our health. I find it selfish and rude to criticize women for the choice to dress in way that preserves their dignity and health. But in the same way women should be kindly supported for the opposite- I suspect Meghan doesn’t wears hose because she would be incredibly uncomfortable wearing them while pregnant. On a large pregnant belly, they can be agony. I wish we could all be supportive and kind to others in their personal choices. The problem I have with the constant comments about tights is when people start going on about non-existent protocol. It's the Queen's preference not a rule. People can have their opinions and that's fine - we dress the way we want and we like what we like. I do take issue with women being described as tarty or dubious or disreputable just because they choose not to wear tights. Seems to me that some rather unkind judgements are being made about the person not their clothes. Thank you, Franny. The name-calling is childish and hateful. Shinystuffbuff, Meghan is dressing for current fashion trends, not how we dressed 20 years ago. There is nothing wrong with that. I do fail to see how pantyhose "preserve our health". That confuses me. I agree with you that we should be supportive of personal choices. 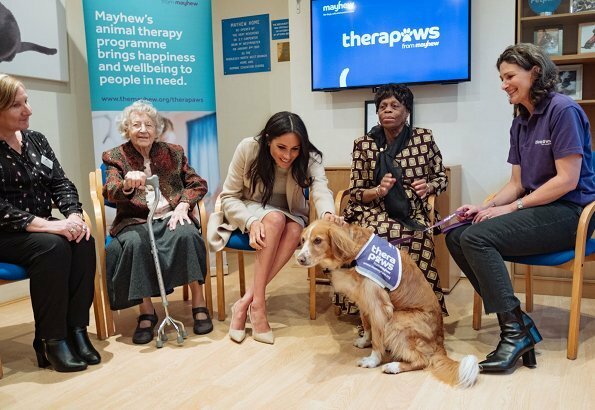 The reality is that the comments about Meghan's bare legs are not going to stop. The criticism continues and have become personal attacks. I do hope the attacks stop. Or, at least, I hope she doesn’t read them. I suspect the attacks are coming because of those of us old enough to remember when tights and pantyhose were in style- which seems like yesterday to me- going without anything covering your legs on a cold day in public feels a lot like not wearing a shirt over your bra in public! As with any change that feels sudden, people will push back and be vocal. And unfortunately the very visible Meghan is their target. As for the health reason I stated above, many women wear support hose which helps prevent blood clots and slow progressive vein disease. I wore pantyhose for many years, but don't anymore. I am not one to get stuck in any style--not with my clothes, hair or makeup. I do like to keep up-to-date. I have friends that have not changed since our school days and I find it very aging. If it is cold out, I would wear opaque tights and boots or booties. As for the health issues mentioned, I have always understood that compression stockings need to be worn to prevent blood clots, but I do not know enough about it as I do not have that issue myself. I am so glad we are on the same page about the attacks on Meghan. It doesn't matter who is being attacked, it crosses the line. In the very serious place of employment where I've worked, pantyhose are considered relics of a sexist past when constricted and uncomfortable clothes were foisted on women, whether they liked them or not. No intelligent or educated woman wears such a corset on their legs---either with suits or with the long and flowing summer skirts that are in fashion. I think she can be without tights if she wants, she must be feeling very warm with her pregnancy. It has also many times been told that there are no real tight necessity in British court. I am sure Meghan keeps tights if she feels cold, although thin tights are not any warming items. I am old enough that I have had tights decades. I am also very much a dress person. Today I have normal den tights very very seldom, winter time some really thick ones I have to wear, out climate is so cold and we have lots of snow. But I walk really far to fall without any tights and leave them early springtime. I think winter suits or dresses or coats don't look good if a person doesn't wear stockings (tights or pantyhose). Somehow the look with it is more polished. But that is only in winter time . Het begint meer en meer op te vallen dat ze een donkere huid heeft. She has beautiful color of the skin . Why would the color of her skin be brought up? What does that have to do with anything? @ Coralie , to be respected has nothing to do with wearing or not wearing tights. Your thinking must be from 17 century . No, Anonymous, because in 17th century there was no banking- and insurance-industry like nowadays. At that time this business was completely different, not so much contact with the end consumer. @ Coralie , Bank of Scotland was established exactly on 17 July 1695 and open for BUSINESS in February 1696 and soon after Bank of England . Yes, and Gringotts is even older! What I wanted to say is that nowadays everybody has a giro account, it is a mass market nowadays, so that banks work on their reputation and what is most important for them is to appear as serious and reliable to the end consumer. Every clerk represents the bank and that is why there is a dress code - because the end consumer reacts to the way clerks are dressed. As for being serious, would you be so kind to write your name under your posts, Ms Anonymous? Don't you agree that would be polite? She's gorgeous!! She radiates happiness and energy!! She's doing a very good job!! Well done Duchess! !